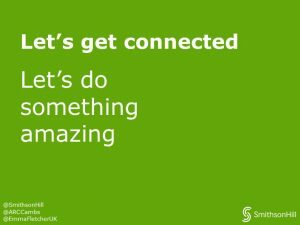 Let’s get connected – let’s do something amazing! Our MD, Emma Fletcher recently spoke at the 2019 CaMKOx corridor conference, below we share her vision for what the corridor could be. One could argue that the Oxford – Milton Keynes – Cambridge corridor represents the key Innovation Areas in the heartland of the UK – with world-leading innovation clusters, research centres and unprecedented growth opportunities. But with growth comes a need to provide infrastructure to support and enable it. World-leading innovation requires thinking big – and joining up Oxford, Milton Keynes and Cambridge is certainly that. The prospect of joining these corridors into an innovation super-cluster is surely one of the most exciting economic ideas of our time. In reality the CaMKOx Arc provides a gateway much further than its own corridor and with that comes the challenge of a broader infrastructure discussion with our neighbours. 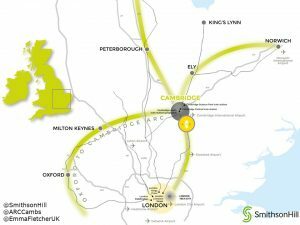 Of a different scale, but no less critical to the UK’s place on a global platform, our ARC project has reach through the London Stansted Cambridge corridor, into the East of England, to the North through Peterborough and of course to the CaMKOx Arc. Underpinning all these questions is the need to do all of this in the most environmentally sustainable way and to have fun while we are at it. There are three additional thoughts for all key developments to take into account. Infrastructure – not just the obvious but also the utilities – both energy and water. Also the critical importance of a digital connectivity infrastructure as necessity, not nice to have, and the importance of sustainability within this infrastructure. Keep Innovation front of mind – we need to be thinking of infrastructure solutions that will deliver for the 21st Century and beyond, not just for today. This requires involvement from broader business communities and stakeholders, young and old, to continue to ‘hold feet to the fire’ to ensure what is ultimately delivered is what is actually needed. It also means that the funding of large-scale projects should also consider alternatives away from conventional thinking and business can help the public sector with this. And finally, on Innovation – one thing that should be considered is that we cannot just pick up the ‘fire’ that is successful in one place and move it elsewhere – we need to allow innovation to agglomerate where it makes sense. This means we need to be creative in understanding where the innovation is across the entire area and playing to those strengths. Inclusion, we mean two things – firstly inclusion of all groups working collaboratively – schemes like the Oxford to Cambridge corridor will only succeed if individual objectives are delivered as a collective. This means our officers and politicians, but also our business community who will have a role to play in ensuring the solutions delivered are fit for purpose for them and their employees. And just as important, we are referring to social inclusion enabling the communities to help with place-making and delivering a corridor that makes sense for all. At the heart of the vision for the corridor has to be the objective to facilitate excellence. A vision not just for road, railway or new housing estates, but a place for people to have fun and get out into the world around them, whether walking, cycling, boating or horse-riding. A corridor is a physical place but it’s the people and the ideas within it that will make it world-leading. We all have a duty to ensure we deliver the vision for the future. Let’s create a connected corridor and do something amazing, together.